I’m not sure what it is that they put in the water over at Google HQ but whatever it is, I want some. Such a large percentage of my articles have been devoted to the material that Google relentlessly produces that, without them, I genuinely doubt I would have found sufficient interesting content to keep this article going over the last eight years. To top it all they go and release “Google Street View”. I can practically imagine the meeting in which an employee stood up and proclaimed “let’s drive specially modified cars down every street in the entire world and create a three dimensional virtual representation that anybody can then browse at home for free”. In any other company you would undoubtedly be ridiculed but at Google this idea was taken on board and followed through so over a period of two years practically every major city in the developed world has been captured. At some point most of us would have undoubtedly used Google Maps which allows you to view a top down map or satellite image of anywhere on the planet. With Street View this is enhanced as you are able to then drop down to street level where you can then look around as if you were actually there. 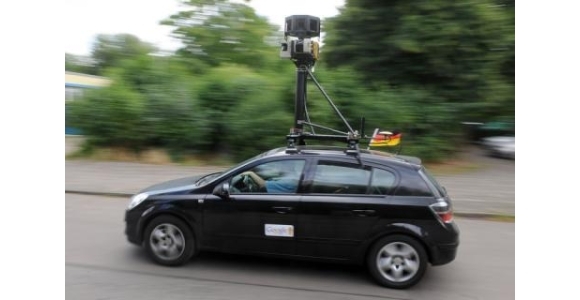 The system works as modified cars were fitted with cameras which captured their surroundings at 10 to 20 metre intervals along the stretch of road on which they were driving. The finished images allow you to view the world 360 degrees horizontally and 270 degrees vertically and you can navigate down the streets by simply clicking the direction in which you wish to travel. When you reach a junction you will be given the choice of which route you wish to take so you have complete freedom of the areas you wish to explore. The UK maps only came online last week and as such the coverage is still a little limited, there isn’t any coverage of the South West. Cities that have been covered in the UK however include London, Oxford, Cambridge, Nottingham, Derby, Sheffield, Leeds, Manchester, Bradford, Scunthorpe, Bristol, Norwich, Newcastle-upon-Tyne, Birmingham, Coventry, Liverpool, Southampton, ,Belfast, Cardiff, Swansea, Glasgow, Edinburgh, Dundee and Aberdeen. Despite automatically blurring number plates and faces as well as giving users the opportunity to remove any views that are deemed inappropriate, Street Views has given the campaigners new fodder to reopen the whole privacy debate. Privacy International in the UK has already sent a formal complaint to the Information Commissioner’s Office (ICO) asking for the service to be switched off until a complete investigation can be completed. This is following complaints from 200 members of the pubic who claim that they were identifiable on the service despite the automatic blurring. It seems odd to me that these two hundred individuals didn’t simply click the ‘report an image’ button to have their image removed permanently but instead choose to locate the address for Privacy International to compose a strongly worded letter of protest. For the sake of the other 60,954,800 people in the UK who haven’t felt the need to complain I hope that the service remains online as provided the privacy of the individual continues to be respected via face blurring and manual image removal tools I don’t see there being any real cause for concern.